2. All bills for raising revenue shall originate in..
3. Which of the following powers is NOT granted to Congress? The Constitution does not grant Congress the power to regulate schools. The Tenth Amendment says that all powers not listed are vested in the States and the People. How Congress came up with this power is beyond the scope of the plain wording and the intent of the Constitution. 4. The Bill of Rights consists of how many amendments to the Constitution? The Bill of Rights is the first ten amendments to the Constitution. Although Congress does try to play God over our behavior, the intent of the Constitution is to define, affirm, and protect our rights (see Preamble). 6. Where is the phrase “separation of church and state” found? It is surprising how many Christians and conservatives get this one wrong. It must be from too many years of brainwashing by the ACLU. “Separation of church and state” is a phrase used in a letter from Thomas Jefferson to the Danbury Baptist Association on January 1st, 1802. The Baptists were afraid Congress would establish a state denomination. Jefferson wrote to assure them the Constitution forbid the establishment of any denomination as the state church. On the other hand, we know Jefferson never intended to impede public religious activity, or expression because he not only signed bills appropriating financial support for chaplains in Congress and the armed services; he signed the articles of war in 1806 which urged soldiers to attend church services; he offered a National Prayer For Peace in 1805; and he wrote in a letter to Samuel Miller, in 1808, he viewed “the government of the US as interdicted by the Constitution from intermeddling with religious institutions, their doctrines, discipline, or exercises.” (America’s God and Country, Federer, William J. 1994, FAME Publishing, pgs 324-28). 7. According to the Constitution, and except for Washington D.C., how much land can the federal government own, or control? 8. Which amendment and date authorized the Federal Reserve System? There is no such amendment authorizing the Federal Reserve System. 9. How many states were represented at the Constitutional Convention? There were 13 original States; however, Rhode Island did not have any representatives at the Constitutional Convention. They were jealous of their rights and believed the larger States would overpower or swallow up the smaller States in the creation of a new union. They were the last State to ratify the Constitution; the last to get on board, only after they realized the nation was going ahead without them. 10. 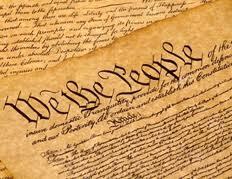 Which Article and Section of the Constitution enumerates the specific powers of Congress? How many are listed? The powers are enumerated in Article 1, §8. There are 18 of them.